Just a couple of weeks ago, astronomers from Caltech announced their third detection of gravitational waves from the Laser Interferometer Gravitational-Wave Observatory or LIGO. As with the previous two detections, astronomers have determined that the waves were generated when two intermediate-mass black holes slammed into each other, sending out ripples of distorted spacetime. One black hole had 31.2 times the mass of the Sun, while the other had 19.4 solar masses. The two spiraled inward towards each other, until they merged into a single black hole with 48.7 solar masses. And if you do the math, twice the mass of the Sun was converted into gravitational waves as the black holes merged. These gravitational waves traveled outward from the colossal collision at the speed of light, stretching and compressing spacetime like a tsunami wave crossing the ocean until they reached Earth, located about 2.9 billion light-years away. The waves swept past each of the two LIGO facilities, located in different parts of the United States, stretching the length of carefully calibrated laser measurements. And from this, researchers were able to detect the direction, distance and strength of the original merger. Seriously, if this isn’t one of the coolest things you’ve ever heard, I’m clearly easily impressed. Now that the third detection has been made, I think it’s safe to say we’re entering a brand new field of gravitational astronomy. In the coming decades, astronomers will use gravitational waves to peer into regions they could never see before. Being able to perceive gravitational waves is like getting a whole new sense. It’s like having eyes and then suddenly getting the ability to perceive sound. This whole new science will take decades to unlock, and we’re just getting started. As Einstein predicted, any mass moving through space generates ripples in spacetime. When you’re just walking along, you’re actually generating tiny ripples. If you can detect these ripples, you can work backwards to figure out what size of mass made the ripples, what direction it was moving, etc. Even in places that you couldn’t see in any other way. Let me give you a couple of examples. Black holes, obviously, are the low hanging fruit. When they’re not actively feeding, they’re completely invisible, only detectable by how they gravitational attract objects or bend light from objects passing behind them. But seen in gravitational waves, they’re like ships moving across the ocean, leaving ripples of distorted spacetime behind them. With our current capabilities through LIGO, astronomers can only detect the most massive objects moving at a significant portion of the speed of light. A regular black hole merger doesn’t do the trick – there’s not enough mass. Even a supermassive black hole merger isn’t detectable yet because these mergers seem to happen too slowly. This is why all the detections so far have been intermediate-mass black holes with dozens of times the mass of our Sun. And we can only detect them at the moment that they’re merging together, when they’re generating the most intense gravitational waves. If we can boost the sensitivity of our gravitational wave detectors, we should be able to spot mergers of less and more massive black holes. But merging isn’t the only thing they do. Black holes are born when stars with many more times the mass of our Sun collapse in on themselves and explode as supernovae. Some stars, we’ve now learned just implode as black holes, never generating the supernovae, so this process happens entirely hidden from us. Is there a singularity at the center of a black hole event horizon, or is there something there, some kind of object smaller than a neutron star, but bigger than an infinitely small point? As black holes merge together, we could see beyond the event horizon with gravitational waves, mapping out the invisible region within to get a sense of what’s going on down there. We want to know about even less massive objects like neutron stars, which can also form from a supernova explosion. These neutron stars can orbit one another and merge generating some of the most powerful explosions in the Universe: gamma ray bursts. But do neutron stars have surface features? Different densities? Could we detect a wobble in the gravitational waves in the last moments before a merger? And not everything needs to merge. Sensitive gravitational wave detectors could sense binary objects with a large imbalance, like a black hole or neutron star orbiting around a main sequence star. We could detect future mergers by their gravitational waves. Are gravitational waves a momentary distortion of spacetime, or do they leave some kind of permanent dent on the Universe that we could trace back? Will we see echoes of gravity from gravitational waves reflecting and refracting through the fabric of the cosmos? Perhaps the greatest challenge will be using gravitational waves to see beyond the Cosmic Microwave Background Radiation. This region shows us the Universe 380,000 years after the Big Bang, when everything was cool enough for light to move freely through the Universe. But there was mass there, before that moment. Moving, merging mass that would have generated gravitational waves. As we explained in a previous article, astronomers are working to find the imprint of these gravitational waves on the Cosmic Microwave Background, like an echo, or a shadow. Perhaps there’s a deeper Cosmic Gravitational Background Radiation out there, one which will let us see right to the beginning of time, just moments after the Big Bang. And as always, there will be the surprises. The discoveries in this new field that nobody ever saw coming. The “that’s funny” moments that take researchers down into whole new fields of discovery, and new insights into how the Universe works. The LIGO project was begun back in 1994, and the first iteration operated from 2002 to 2012 without a single gravitational wave detection. It was clear that the facility wasn’t sensitive enough, so researchers went back and made massive improvements. In 2008, they started improving the facility, and in 2015, Advanced LIGO came online with much more sensitivity. With the increased capabilities, Advanced LIGO made its first discovery in 2016, and now two more discoveries have been added. LIGO can currently only detect the general hemisphere of the sky where a gravitational wave was emitted. And so, LIGO’s next improvement will be to add another facility in India, called INDIGO. In addition to improving the sensitivity of LIGO, this will give astronomers three observations of each event, to precisely detect the origin of the gravitational waves. Then visual astronomers could do follow up observations, to map the event to anything in other wavelengths. A European experiment known as Virgo has been operating for a few years as well, agreeing to collaborate with the LIGO team if any detections are made. So far, the Virgo experiment hasn’t found anything, but it’s being upgraded with 10 times the sensitivity, which should be fully operational by 2018. A Japanese experiment called the Kamioka Gravitational Wave Detector, or KAGRA, will come online in 2018 as well, and be able to contribute to the observations. It should be capable of detecting binary neutron star mergers out to nearly a billion light-years away. Just with visual astronomy, there are a set of next generation supergravitational wave telescopes in the works, which should come online in the next few decades. The Europeans are building the Einstein Telescope, which will have detection arms 10 km long, compared to 4 km for LIGO. That’s like, 6 more km. There’s the European Space Agency’s space-based Laser Interferometer Space Antenna, or LISA, which could launch in 2030. This will consist of a fleet of 3 spacecraft which will maintain a precise distance of 2.5 million km from each other. Compare that to the Earth-based detection distances, and you can see why the future of observations will come from space. And that last idea, looking right back to the beginning of time could be a possibility with the Big Bang Observer mission, which will have a fleet of 12 spacecraft flying in formation. This is still all in the proposal stage, so no concrete date for if or when they’ll actually fly. Gravitational wave astronomy is one of the most exciting fields of astronomy. This entirely new sense is pushing out our understanding of the cosmos in entirely new directions, allowing us to see regions we could never even imagine exploring before. I can’t wait to see what happens next. Whenever we talk about the expanding Universe, everyone wants to know how this is going to end. Sure, they say, the fact that most of the galaxies we can see are speeding away from us in all directions is really interesting. 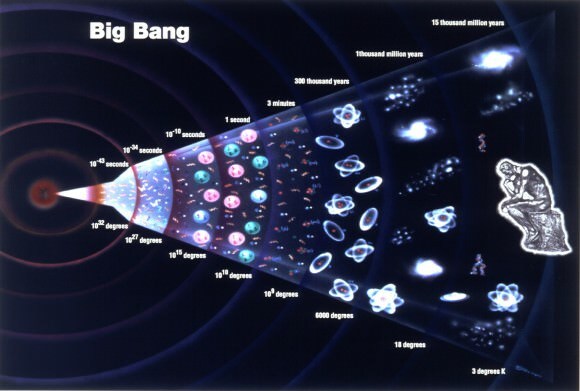 Sure, they say, the Big Bang makes sense, in that everything was closer together billions of years ago. But how does it end? Does this go on forever? Do galaxies eventually slow down, come to a stop, and then hurtle back together in a Big Crunch? Will we get a non-stop cycle of Big Bangs, forever and ever? We’ve done a bunch of articles on many different aspects of this question, and the current conclusion astronomers have reached is that because the Universe is flat, it’s never going to collapse in on itself and start another Big Bang. But wait, what does it mean to say that the Universe is “flat”? Why is that important, and how do we even know? Before we can get started talking about the flatness of the Universe, we need to talk about flatness in general. What does it mean to say that something is flat? If you’re in a square room and walk around the corners, you’ll return to your starting point having made 4 90-degree turns. You can say that your room is flat. This is Euclidian geometry. But if you make the same journey on the surface of the Earth. Start at the equator, make a 90-degree turn, walk up to the North Pole, make another 90-degree turn, return to the equator, another 90-degree turn and return to your starting point. In one situation, you made 4 turns to return to your starting point, in another situation it only took 3. That’s because the topology of the surface you were walking on decided what happens when you take a 90-degree turn. You can imagine an even more extreme example, where you’re walking around inside a crater, and it takes more than 4 turns to return to your starting point. Another analogy, of course, is the idea of parallel lines. If you fire off two parallel lines at the North pole, they move away from each other, following the topology of the Earth and then come back together. Now, what about the Universe itself? You can imagine that same analogy. 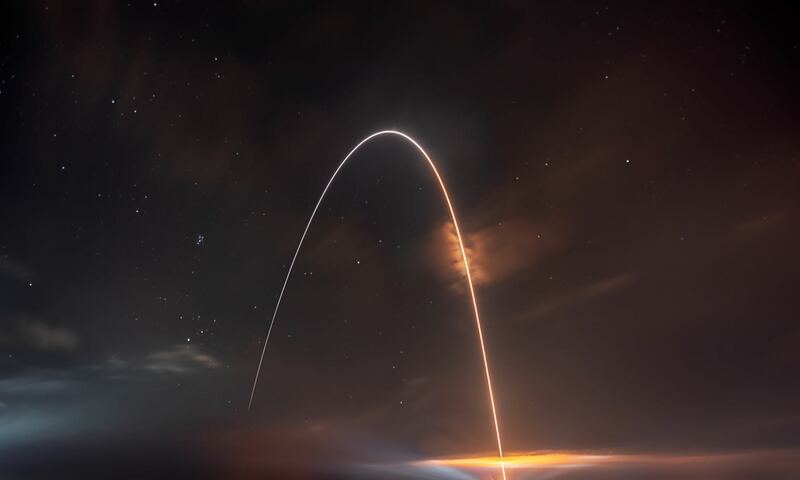 Imaging flying out into space on a rocket for billions of light-years, performing 90-degree maneuvers and returning to your starting point. You can’t do it in 3, or 5, you need 4, which means that the topology of the Universe is flat. Which is totally intuitive, right? I mean, that would be your assumption. But astronomers were skeptical and needed to know for certain, and so, they set out to test this assumption. In order to prove the flatness of the Universe, you would need to travel a long way. And astronomers use the largest possible observation they can make. The Cosmic Microwave Background Radiation, the afterglow of the Big Bang, visible in all directions as a red-shifted, fading moment when the Universe became transparent about 380,000 years after the Big Bang. When this radiation was released, the entire Universe was approximately 2,700 C. This was the moment when it was cool enough for photons were finally free to roam across the Universe. The expansion of the Universe stretched these photons out over their 13.8 billion year journey, shifting them down into the microwave spectrum, just 2.7 degrees above absolute zero. With the most sensitive space-based telescopes they have available, astronomers are able to detect tiny variations in the temperature of this background radiation. And here’s the part that blows my mind every time I think about it. These tiny temperature variations correspond to the largest scale structures of the observable Universe. A region that was a fraction of a degree warmer become a vast galaxy cluster, hundreds of millions of light-years across. The Cosmic Microwave Background Radiation just gives and gives, and when it comes to figuring out the topology of the Universe, it has the answer we need. If the Universe was curved in any way, these temperature variations would appear distorted compared to the actual size that we see these structures today. But they’re not. To best of its ability, ESA’s Planck space telescope, can’t detect any distortion at all. The Universe is flat. Well, that’s not exactly true. According to the best measurements astronomers have ever been able to make, the curvature of the Universe falls within a range of error bars that indicates it’s flat. Future observations by some super Planck telescope could show a slight curvature, but for now, the best measurements out there say… flat. We say that the Universe is flat, and this means that parallel lines will always remain parallel. 90-degree turns behave as true 90-degree turns, and everything makes sense. But what are the implications for the entire Universe? What does this tell us? Unfortunately, the biggest thing is what it doesn’t tell us. We still don’t know if the Universe is finite or infinite. If we could measure its curvature, we could know that we’re in a finite Universe, and get a sense of what its actual true size is, out beyond the observable Universe we can measure. We know that the volume of the Universe is at least 100 times more than we can observe. At least. If the flatness error bars get brought down, the minimum size of the Universe goes up. And remember, an infinite Universe is still on the table. Another thing this does, is that it actually causes a problem for the original Big Bang theory, requiring the development of a theory like inflation. Since the Universe is flat now, it must have been flat in the past, when the Universe was an incredibly dense singularity. And for it to maintain this level of flatness over 13.8 billion years of expansion, in kind of amazing. In fact, astronomers estimate that the Universe must have been flat to 1 part within 1×10^57 parts. Which seems like an insane coincidence. The development of inflation, however, solves this, by expanding the Universe an incomprehensible amount moments after the Big Bang. Pre and post inflation Universes can have vastly different levels of curvature. In the olden days, cosmologists used to say that the flatness of the Universe had implications for its future. If the Universe was curved where you could complete a full journey with less than 4 turns, that meant it was closed and destined to collapse in on itself. And it was more than 4 turns, it was open and destined to expand forever. Well, that doesn’t really matter any more. In 1998, the astronomers discovered dark energy, which is this mysterious force accelerating the expansion of the Universe. Whether the Universe is open, closed or flat, it’s going to keep on expanding. In fact, that expansion is going to accelerate, forever. I hope this gives you a little more understanding of what cosmologists mean when they say that the Universe is flat. And how do we know it’s flat? Very precise measurements in the Cosmic Microwave Background Radiation. Is there anything that all pervasive relic of the early Universe can’t do? How was our Universe created? How did it come to be the seemingly infinite place we know of today? And what will become of it, ages from now? These are the questions that have been puzzling philosophers and scholars since the beginning the time, and led to some pretty wild and interesting theories. Today, the consensus among scientists, astronomers and cosmologists is that the Universe as we know it was created in a massive explosion that not only created the majority of matter, but the physical laws that govern our ever-expanding cosmos. This is known as The Big Bang Theory. For almost a century, the term has been bandied about by scholars and non-scholars alike. This should come as no surprise, seeing as how it is the most accepted theory of our origins. But what exactly does it mean? How was our Universe conceived in a massive explosion, what proof is there of this, and what does the theory say about the long-term projections for our Universe? The Cosmic Microwave Background (CMB) radiation is one of the greatest discoveries of modern cosmology. Astrophysicist George Smoot once likened its existence to “seeing the face of God.” In recent years, however, scientists have begun to question some of the attributes of the CMB. Peculiar patterns have emerged in the images taken by satellites such as WMAP and Planck – and they aren’t going away. Now, in a paper published in the December 1 issue of The Astronomical Journal, one scientist argues that the existence of these patterns may not only imply new physics, but also a revolution in our understanding of the entire Universe. Let’s recap. Thanks to a blistering ambient temperature, the early Universe was blanketed in a haze for its first 380,000 years of life. During this time, photons relentlessly bombarded the protons and electrons created in the Big Bang, preventing them from combining to form stable atoms. All of this scattering also caused the photons’ energy to manifest as a diffuse glow. The CMB that cosmologists see today is the relic of this glow, now stretched to longer, microwave wavelengths due to the expansion of the Universe. As any fan of the WMAP and Planck images will tell you, the hallmarks of the CMB are the so-called anisotropies, small regions of overdensity and underdensity that give the picture its characteristic mottled appearance. These hot and cold spots are thought to be the result of tiny quantum fluctuations born at the beginning of the Universe and magnified exponentially during inflation. Given the type of inflation that cosmologists believe occurred in the very early Universe, the distribution of these anisotropies in the CMB should be random, on the order of a Gaussian field. But both WMAP and Planck have confirmed the existence of certain oddities in the fog: a large “cold spot,” strange alignments in polarity known as quadrupoles and octupoles, and, of course, Stephen Hawking’s initials. In his new paper, Fulvio Melia of the University of Arizona argues that these types of patterns (Dr. Hawking’s signature notwithstanding) reveal a problem with the standard inflationary picture, or so-called ΛCDM cosmology. According to his calculations, inflation should have left a much more random assortment of anisotropies than the one that scientists see in the WMAP and Planck data. In fact, the probability of these particular anomalies lining up the way they do in the CMB images is only about 0.005% for a ΛCDM Universe. R(h)=ct holds true for both the standard cosmological scenario and Melia’s model, with one crucial difference: in ΛCDM cosmology, this equation only works for the current age of the Universe. That is, at any time in the distant past or future, the Universe would have obeyed a different law. Scientists explain this odd coincidence by positing that the Universe first underwent inflation, then decelerated, and finally accelerated again to its present rate. Melia hopes that his model, a Universe that requires no inflation, will provide an alternative explanation that does not rely on such fine-tuning. He calculates that, in a R(h)=ct Universe, the probability of seeing the types of strange patterns that have been observed in the CMB by WMAP and Planck is 7–10%, compared with a figure 1000 times lower for the standard model. So, could this new way of looking at the cosmos be a death knell for ΛCDM? Probably not. Melia himself cites a few less earth-shattering explanations for the anomalous signals in the CMB, including foreground noise, statistical biases, and instrumental errors. Incidentally, the Planck satellite is scheduled to release its latest image of the CMB this week at a conference in Italy. If these new results show the same patterns of polarity that previous observations did, cosmologists will have to look into each possible explanation, including Melia’s theory, more intensively. The Oscillating Universe Theory is a cosmological model that combines both the Big Bang and the Big Crunch as part of a cyclical event. That is, if this theory holds true, then the Universe in which we live in exists between a Big Bang and a Big Crunch. In other words, our universe can be the first of a possible series of universes or it can be the nth universe in the series. As we know, in the Big Bang Theory, the Universe is believed to be expanding from a very hot, very dense, and very small entity. In fact, if we extrapolate back to the moment of the Big Bang, we are able to reach a point of singularity characterized by infinitely high energy and density, as well as zero volume. This description would only mean one thing – all the laws of physics will be thrown out of the window. This is understandably unacceptable to physicists. To make matters worse, some cosmologists even believe that the Universe will eventually reach a maximum point of expansion and that once this happens, it will then collapse into itself. This will essentially lead to the same conditions as when we extrapolate back to the moment of the Big Bang. To remedy this dilemma, some scientists are proposing that perhaps the Universe will not reach the point of singularity after all. Instead, because of repulsive forces brought about by quantum effects of gravity, the Universe will bounce back to an expanding one. An expansion (Big Bang) following a collapse (Big Crunch) such as this is aptly called a Big Bounce. The bounce marks the end of the previous universe and the beginning of the next. The probability of a Big Bounce, or even a Big Crunch for that matter, is however becoming negligible. The most recent measurements of the CMBR or cosmic microwave background radiation shows that the Universe will continue on expanding and will most likely end in what is known as a Big Freeze or Heat Death. CMBR readings are currently being gathered by a very accurate measuring device known as the WMAP or Wilkinson Microwave Anisotropy Probe. It is the same device that has measured with sharp precision the age of our universe. It is therefore highly unlikely that future findings will deviate largely from what has been discovered regarding the Universe’s expansion now. There is however one mysterious entity whose deeper understanding of may change the possibilities. This entity, known as dark energy, is believed to be responsible for pushing the galaxies farther apart and subsequently the universe’s accelerated expansion. Unless its actual properties are very dissimilar from what it is showing now, we may have to shelve the Oscillating Universe Theory.